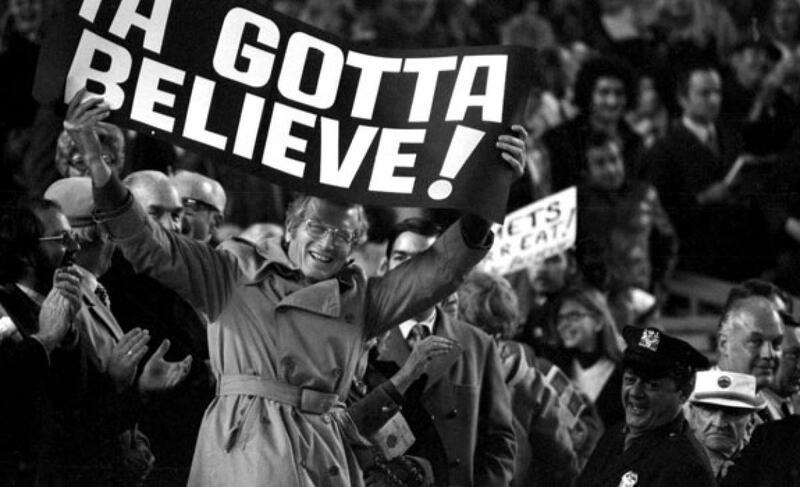 Thoughts on the Marlins, 07-08 collapses, 2015 chances | We Gotta Believe! The Mets played their last game of the season against the Miami Marlins last night, and count me as absolutely thrilled. Any Mets fan going back 8 years or more remembers that it was the (at the time) Florida Marlins who dealt the final decisive blow to those doomed Mets teams. Fresh in my mind is the sight of Miguel Olivo charging Jose Reyes at 3rd base, the sight of a dejected Tom Glavine leaving the mound, an infield dribbler for Paul Hoover against a dominant John Maine, and Johan Santana‘s potential season-saving 3-hit shutout. Not to mention the gut-wrenching home run by Met killer Wes Helms against Scott Schoeneweis. Playing the Marlins 19 times a season hasn’t failed to bring back those dramatic highs and lows. Clearest in my memory is the 2007 season, because that was the real killer. 2008 was a race all the way, and the Mets couldn’t keep up with the competative Phillies and resurgent Brewers, led by C.C. Sabathia. But 2007 was the one – the Mets were supposed to repeat their 2006 success. I remember John Maine, one of my favorite players on that team, had a dominant, potential season-saving performance (despite the fact that it was a 13-0 rout). With two outs in the 8th inning, 3rd catcher Paul Hoover hit an infield squibbler to break up Maine’s no-hit bid. I truly thought it would be destiny – Maine would throw the first no-hitter in franchise history and they would keep pace with and pass the Phillies, whether the next day or during a one-game playoff. They were tied with the Phillies for the division lead and the Rockies for one game out in the wild card. To top it off, Tom Glavine was on the mound the next day. Not everything could break against them… could it? After all, in 07-08, they got some stellar performances from certain players, even if they did dance around the injury bug a bit. 2007 and 2008 were arguably David Wright‘s best seasons in the majors; Wright had a 151 wRC+ in 2007 and a 143 wRC+ in 2008. One could argue that Wright, who led the National League with 8.4 fWAR, deserved the MVP award in 2007 over Jimmy Rollins (7th in the league at 6.5, 2nd on his own team to Chase Utley‘s 7.7). Jose Reyes stole 78 bases in 2008, and Carlos Beltran added a 33 home run season (122 wRC+). 07 also saw solid if unspectacular seasons for Carlos Delgado and Shawn Green (even if their lack of defensive ability dragged them down). In 2008, they had a fantastic season from newly acquired Johan Santana, whose 2.53 ERA led baseball and whose 7.1 rWAR was second only to eventual Cy Young Award winner Tim Lincecum. These teams were very, very good with an exciting young core, even if they did give too many starts to Orlando Hernandez and Jorge Sosa and too many plate appearances to Damion Easley and Luis Castillo. I understand Mets Twitter’s reaction to a 7.5 game lead, with a 9.5 game lead only two days ago. That being said, let’s look at it in perspective: Leaving the Nationals series, we had a 7.0 game lead with 23 to play. From then on, we have gone 5-2, compared to Washington’s 4-2, to gain half a game. There are only 16 games left to play. Sure we face the Yankees next, but we also face the Braves, the Phillies, the Reds, and the Nationals (let’s hope it doesn’t come down to that last series). Put simply, this team is different. We have much better pitching than both the 07 and 08 teams, with a better bullpen than the 08 team for sure (which, lest we forget, was using Brian Stokes and Luis Ayala to close out games). The offense, park and era adjusted, is roughly the same as the 07-08 teams (100 wRC+ for 07 and 08 teams, 99 wRC+ for 2015). Plus, the 2015 Mets have been remarkably better during the second half, since the first half was spent without David Wright, Yoenis Cespedes, Travis d’Arnaud (for the most part) and a month of Daniel Murphy (wRC+ for the 2015 Mets since the All Star break is 118). Simply put, this team is better constructed and has many fewer holes. But the thing that’s really giving me confidence? We don’t have to play these pesky Marlins again. It may not seem it, but the 2015 team is 11-8 against them, even if the last two series have been tough. Believe it or not, the 2007 team was 11-7 against the Marlins while the 2008 team was 10-8 against them. Miami (Florida, at the time) just seems to wait for the proper moment to strike, and this season, they won’t have their chance. 4 out of their last 6 against New York is far from a fatal blow, with the Mets still holding on to the 7.5 game lead. After the Mets’ 4 game sweep of Atlanta, they had a 9.5 game lead with 19 to play and their playoff odds, per Baseball Prospectus, went to 99.9%. With a 7 game lead and 17 to play in 2007, the odds were at 99.8%. To collapse now, the Mets would have to surpass their own ineptitude. And before anyone says that’s entirely possible, may I remind you that the record of 120 losses from 1962 still holds strong. Let the Marlins spoil the Nationals for once as they open a 4-game series this weekend, and let’s take this series from the Yankees. We’ve gotten this far, there’s nothing to suggest we can’t finish strong.